Yard Signs is rated 4.3 out of 5 by 3. 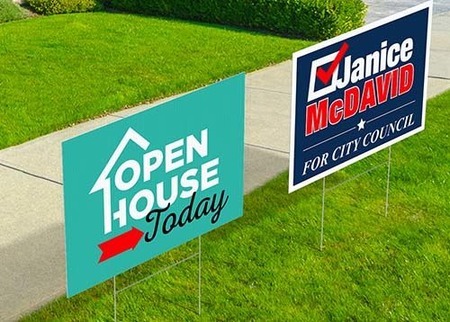 Send a clear message with customized yard signs. Rated 5 out of 5 by WOW The Crowd from Great Yard Signs! Picked up my yard signs two days ago and they turned out nicely, double sided. Rated 5 out of 5 by Educational Bandit Signs from Street Signs that really MOVE traffic...to US! Followed our design perfectly. Came with stakes, signs, and 1,000 cars lined up to read our signs next to the road...OK, no cars, but 2 officers directing traffic around such exquisite "street" artwork...OK, no officers—but they DID get us new customers...REALLY! Worth the price. Reusable (hint: if you get them out of the roadside before 5PM). Yard sign printing can be a great investment for small businesses that need effective outdoor marketing tools. Lightweight, durable, and easy to install, custom yard signs -- also known as lawn signs or bandit signs -- are a staple for local businesses and event organizers alike.. What’s more, it’s simpler than ever to print yard signs according to your specific needs. Yard signs are a versatile, yet highly underrated marketing tool that can offer multiple impressions on countless customers and potential clients. You may have a single sign, or as many as 100 in one order. This makes PrintPlace.com yard signs a good option for situations where you might need only a few, such as for Christmas, graduation, or wedding yard signs, or when you need several signs, such as with political, real estate, and business yard signs. Our yard signs come in a variety of sizes, including the popular 24" x 36" and 20" x 16", perfect for most common applications. To print custom yard signs or any custom order, give us a call or fill out our custom order form. Use our yard sign layout templates to ensure your artwork is sized and formatted correctly. PrintPlace.com layout templates can be downloaded for each standard size label below, in an EPS, PDF, or JPG format for Illustrator or Photoshop. Yard sign printing will never be out of style. Used by event planners, small businesses, and private individuals alike, yard signs offer one of the best mediums for spreading your message outdoors. Yard signs offer flexibility for installation compared to other outdoor print materials. Optional stakes can be used to easily anchor your custom sign to a lawn or soft ground. But contrary to the name they aren’t just for lawns either. Use optional grommets to easily hang them with your own rope or string. The durable water resistant material used offers a good substrate for your design, coupled with excellent performance in outdoor situations. Taken together, this makes them a favorite marketing tool for local advertisers, political campaign strategists, and real estate agents. Maximize your local marketing opportunities and make your own yard sign today.